The Transportation Department has released sales figures for Cash For Clunkers, one of the greatest frauds of the past few months, and the results are interesting. 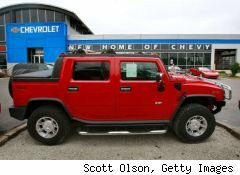 Fifteen 2009 Hummer H3T's were sold and paid for in part with taxpayer money. Hummers. Now defenders of the program will of course be quick to point out that in the grand scheme of the program, 15 Hummers is not a lot -- 29,488 Toyota Corollas were sold. But that's beside the point. Here's the fact: The Cash for Clunkers program forcibly confiscated money from some Americans (or, in the case of deficit spending, the disenfranchised grandchildren who will inherit this mess) and literally used it to buy Hummers for other Americans. Does anyone reading this not have a serious problem with that? Have we lost our way so much in this wave of bailouts and economic stimulus that no one bats an eye when their neighbor sends them a bill for a new Hummer? Can someone please get outraged about this? We can debate back and forth the environmental merits of the program -- and most unbiased observers seem to agree that it's a wash at best with a number of negative unintended consequences. But of course Transporation Secretary Ray Lahood continues to ignore all the evidence and trumpet what a great "win-win" this handout to a bailed out industry is.